Product Dimensions (L x W x H): 17" x 5.5" x 5"
This model is simple, but stunning! It is a FULLY ASSEMBLED replica of a Venetian gondola. It looks and feels like a miniature real boat. This 17-inch model is handcrafted with the highest quality woods from scratch by master artisans using plank on frame construction, just like real boats. Each model takes more than 50 hours to construct and undergoes a demanding quality-control process. 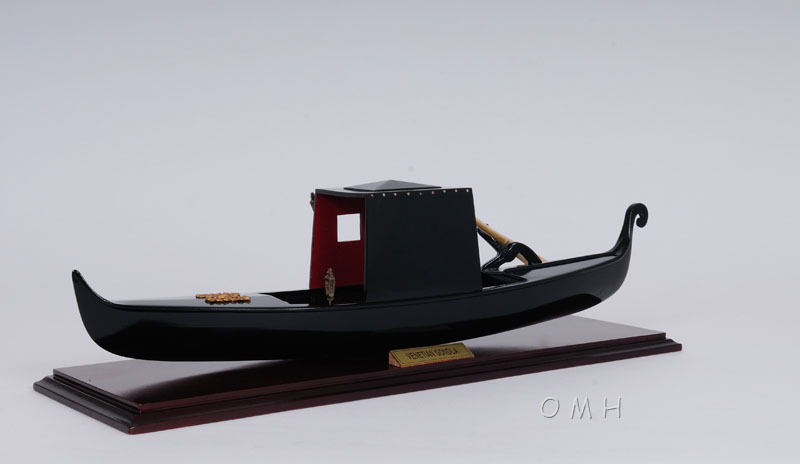 Among the details of this boat model: black painted wood hull, boat house with tourist seatings, oar and oar holder, metal lanterns, brass sculptures, brass nameplate and beautiful stand. The boat is wood, through and through!